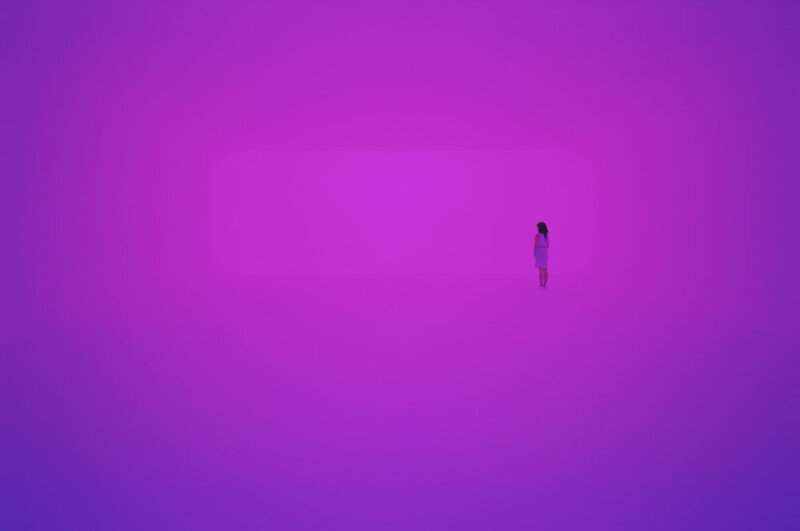 My first experience with a James Turrell piece was with Breathing Light at LACMA in several years ago. I was visiting LA for a few days and spontaneously went to visit LACMA, as my friend lived a couple blocks away. I did not know of Turrell so had no idea what I was getting myself into, and I was absolutely floored with the experience. I went back to the piece once more that day and again on my last day in LA. After that I hoped to see any Turrell piece I came upon. Breathing Light is a part of Turrell’s Ganzfeld series; spaces meant to create similar experiences to the german word Ganzfeld that describes the phenomenon of the total loss of depth perception as in the experience of a white-out. The light seemingly has no source and objects in the space of the piece have no perceivable shade. When looking down into the opening of where the light is at its strongest there becomes a feeling of infinity peering deep into your soul. Unsure how this could apply here. The space was totally visible. The light created a seemingly total absence of shadows, giving an ethereal feeling to the space. In the space I remember being drawn to the concentrated point of where the light was strongest. In relation to the function of modeling, the absence of shadows and ethereal feeling definitely gave to a a total non-establishment of time and location. ; eerily unworldly. The emotional content that the light intended to create an intensely emotional space for myself. The amount of light was a perfect medium, it didn’t feel too intense to view that lots of LED light system do. The color of the light was a range from pink to purple, but after being in the space for a period of time I remember seeing shades of blues and red begin to appear. Although, when looking at a photo I took from the outside of the piece and from the photo from Turrell’s website, I think that my brain was tricking me while in there. The direction of the light surely emanated from the corridor that it was strongest but it’s reflection throughout the piece made it seem that the space never ended. The light was all consuming of the space, no part of it was unlit. Soft edged entirely, it felt natural to be in this artificially lit space. The color of the light seemed to gradually change in the space, but I’m unsure what caused / why that change occurred.